With the setting of one final steel-blue girder, Tappan Zee Constructors (TZC) brought major steel operations to a close today, fully linking the new eastbound span across the Hudson River. TZC began placing the new twin-span bridge’s structural steel girders in spring 2015 and has since installed more than 220 million pounds of All-American steel on the 3.1-mile crossing. 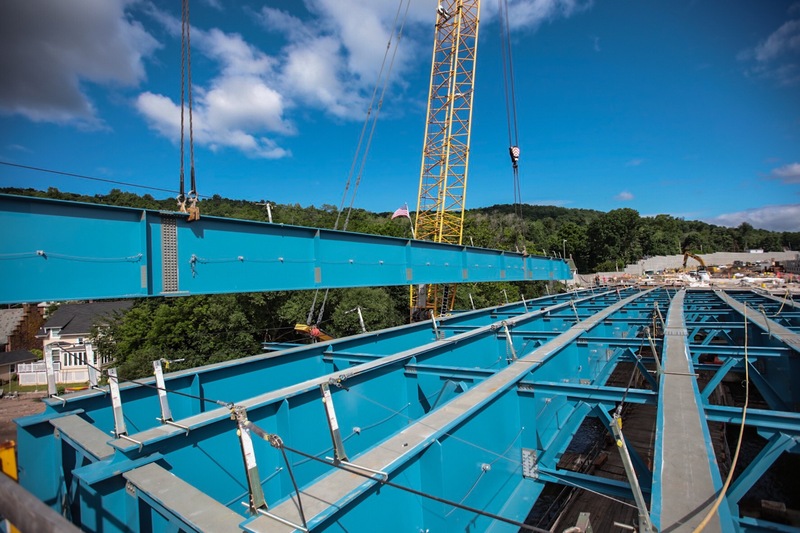 With the eastbound span fully connected by steel, TZC can continue installing precast concrete deck panels to form its base driving surface. The 12-foot-long panels each weigh up to 74,000 pounds and are composed of concrete and galvanized steel. TZC has installed nearly 6,500 deck panels on both spans to date, with fewer than 300 remaining. When all of the deck panels are in place, they will comprise a surface area of more than 65 acres – approximately equal to the deck space of all 19 U.S. Navy aircraft carriers in service. TZC will then install the final driving surface of the eastbound span.